The Exceptional and the Everyday: 144 hours in Kyiv is the first project to analyze the use of Instagram during a social upheaval using computational and visualization techniques. What can visual social media tell us about the experiences of thousands of people and life in their city during a social upheaval? Our research reveals a high level of involvement of people in Kiev sharing images on Instagram with Maidan movement and February 2014 revolutuon. During this period, 9 most frequently used tags were directly related to the Revolution (#maindan, #euromaidan, #revolution, etc). %14 of all images were shared around The Independence (Maindan) Square, the main site of the demonstrations and confrontations between the protesters and government forces. By analyzing images, hashtags and other data, we discover different types of involvement of people in the revolutionary events in their city. Our project also explores how during the exceptional events, the exceptional co-exists with the everyday. The images of Maidan clashes, political slogans, and burned cars and buildings appear right next to everything else: selfies, parties, cultural events, etc. Through a number of different visualizations, we explore how the extra-ordinary and ordinary are connected visually (the use of images) and textually (tags). See all 13K images in one visualization; examine the timeline of top tags and the use of multiple languages ; read the essays about iconography of a revolution and use of social media as a political speech; and look at typical Instagram subjects and compositions through the eyes of a computer. The Exceptional and the Everyday: 144 hours in Kyiv continues previous work of our lab (Software Studies Initiative, softwarestudies.com) with visual social media: phototrails.net (analysis and visualization of 2.3 Instagram photos in 14 global cities, 2013; selfiecity.net (comparison between 3200 selfie photos shared in six cities, 2014; collaboration with Moritz Stefaner). In the new project we specifically focus on the content of images, as opposed to only their visual characteristics. We use computational analysis to locate typical Instagram compositions and manual analysis to identify the iconography of a revolution. We also explore non-visual data that accompanies the images: most frequent tags, the use of English, Ukrainian and Russian languages, dates and times when images their shared, and their geo-coordinates. We worked on this project since January 2014 and published it in October 2014. Visualizations: Visualizing the images and data and interpreting the patterns. Intro: Discussion of our research methods; a brief summary of the events in Kyiv during February 17-22, 2014. Data: Constructing the dataset for the project; data privacy issues. The Infra-ordinary City: Representing the ordinary from literature to social media (essay by Dr. Lev Manovich, the director of the project, The Graduate Center, CUNY). Iconography of the Revolution: What are the popular visual themes in Instagram images of a revolution? (essay by Alise Tifentale, The Graduate Center, CUNY). Matviyenko essay: "Liquid Categories for Augmented Revolutions" (guest essay by Dr. Svitlana Matviyenko, University of Western Ontario). 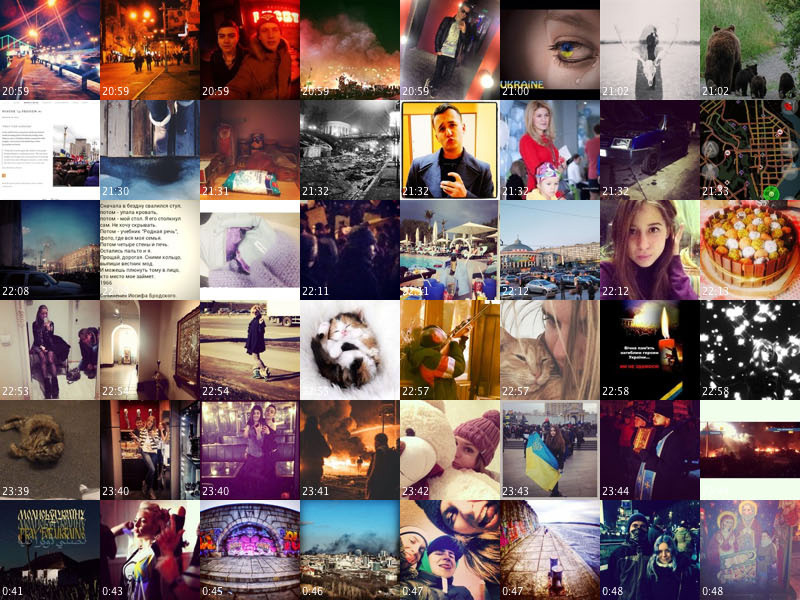 Losh Essay: "Hashtag #Euromaidan: What Counts as Political Speech on Instagram?" (guest essay by Dr. Elizabeth Losh, University of California, San Diego). References: Bibliography of relevant articles and projects. Media contacts: Tanya Domi, Director, Media Relations, The Graduate Center, CUNY. Phone: (212) 817-7283. Project coordinator: Lev Manovich, Professor, The Graduate Center, CUNY; Director, Software Studies Initiative. Public Broadcasting System (PBS) (USA): What Can Instagram Tell Us About Social Upheaval in Ukraine? Copyright by Software Studies Initiative. Powered by Blogger.